30.04.2015 (Hvino News). 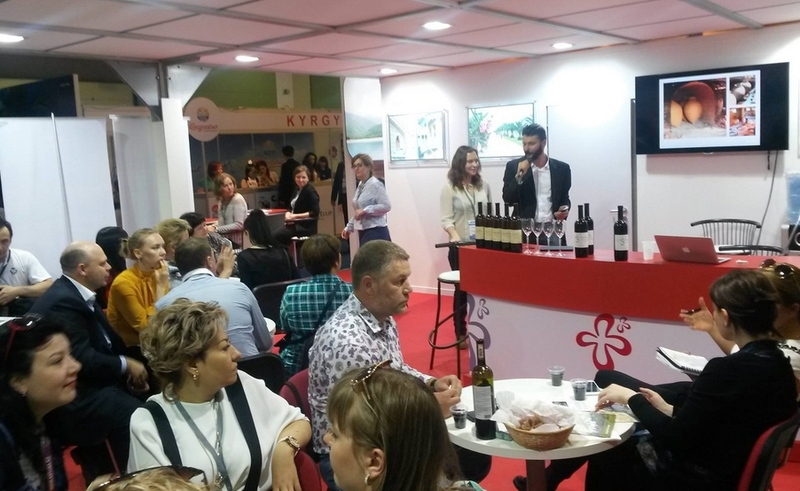 On April 27 an important Georgian wine tasting event was held in Cannes, France. National Wine Agency presented 12 varieties of wine, produced by 7 companies: Shalauri, Winiveria, Chateau Mukhrani, Iago's wine, Teleda / Vita Vinea, Schuchmann Wines. 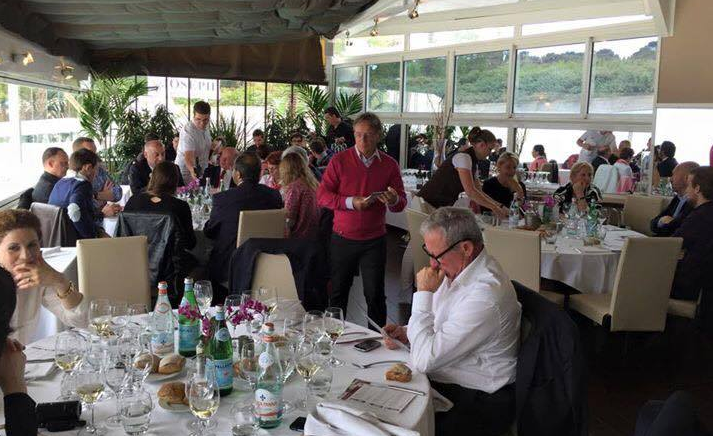 At the event, which was held at Le Cesar restaurant in Cap d'Antibes, dozens of sommeliers had the opportunity to learn more about Georgian wines and grape varieties, and the the country’s wine culture and ancient history of winemaking. 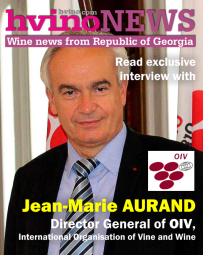 Anna Godabrelidze, chairman of wine-tasting commission of the Agency, said: "This is especially important now, when Georgian wine businesses are searching for new markets and potential importers”. The event was organized by Georgian Alliance Vins (an importer company), Sommelier Association of Côte d'Azur (ASNCAP), and Embassy of Georgia in France. 29.04.2015. 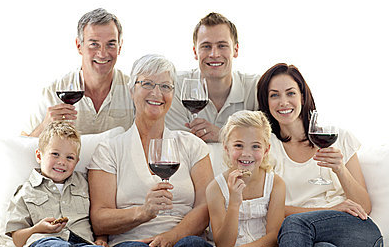 The selection process of family wineries for New Wine Festival is over. An unprecedented number of wineries will take part in the festival this year. 55 winemakers will represent 72 varieties of wine from Kakheti, Kartli, Imereti and Racha regions, see the list below. On April 25, in the village Chardakhi of Mtskheta district, "Georgian Wine Club" organized wine tasting to select family wineries. A committee consisting of 11 people which was composed of enologists, winemakers, winegrowers, writers and wine enthusiasts, gave positive feedback to most of wines out of 110 registered ones. The committee members were adviser of the chairman of National Wine Agency, Goga Tevzadze, president of the Wine Club, Malkhaz Kharbedia, director of New Wine Festival, Iago Bitarishvili, enologists - Kakha Tchotiashvili, Nikoloz Natroshvili, Vano Shiukashvili, and Mikheil Meskhi, journalist and wine writer – Aleko Tskitishvili, wine club members and wine enthusiasts - Vano Stefanashvili and Avtandil Kobakhidze. 29.04.2014 (Hvino News). Seven Georgian wine and brandy producers and the National Wine Agency took part in the Seoul International Wine and Spirits Exhibition (SWS Expo), which took place in the capital of South Korea on April 23-25. The following companies were represented, in a common booth: Shumi, Telavi Wine Cellar, Winery Khareba, Armazi Wines, Kakhetian Wine Cellar, Kakhuri, Sarajishvili. The Georgia's ambassador to Korea, Mr. Nikoloz Apkhazava, attended the opening ceremony. Ambassador Apkhazava is well known for his wine-promotion activities in Korea (read more here: Envoy's Georgian wine push continues, Envoy's wine promotion takes patience, Georgia's envoy pursues ‘wine diplomacy’). SWS Expo brought together about 200 companies from 20 world's countries, and was attended by over 30000 visitors, many of whom are professional buyers including wine and spirits importers, representatives of hotels, restaurants and retailers. 29.04.2015. The sweet smell of Georgian wine will soon spread through the air of Georgia’s capital city Tbilisi. 28.04.2015. Intensive archaeological excavations currently taking place in Georgia could prove the country was the birthplace of vine cultivation. Georgia’s Minister of Culture and Monument Protection Mikheil Giorgadze visited Imiri village in Georgia’s Kvemo Kartli region today where excavations are currently taking place. 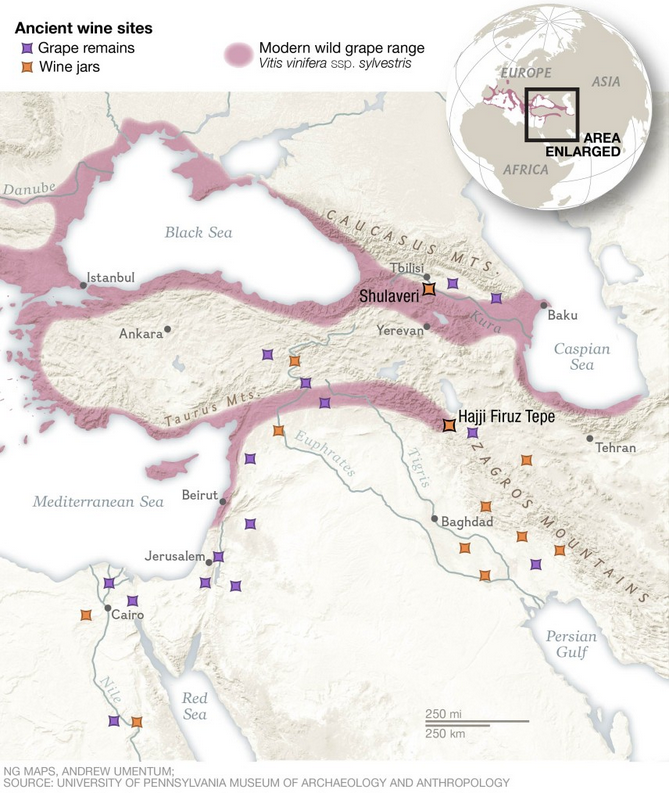 The findings of the dig could prove that ancient people from this site first used wild grapes and vines for health, religious and spiritual reasons, with the vine culture later spreading around the globe. Since ancient times in Georgia, the grape vine and wine has been closely related to cult and religious rituals. This was true for Georgia in both pagan and Christian times. Still today, grapes, grape juice and its products occupy an important place in the diet of the Georgian people. In 2014 the National Museum and the National Wine Agency implemented a joint international project to research the history of Georgian wine, which involved an archaeological dig. 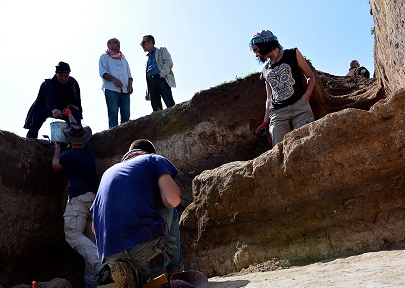 The Government-supported project, titled ‘Research of Georgian Vine and Wine Cultures’, revealed some of the artifacts uncovered in the excavations. 27.04.2015. Georgian Experience presented Otskhanuri Sapere, Krakhuna and Tsolikouri made with traditional method in qvevris by Lagvinari during Kazakhstan International Travel Fair in Almaty. The Georgian stand welcomed visitors interested in the history of traditional Georgian winemaking and, of course, the tasting of natural Qvevri wines. The event was organised by wine tours operator Georgian Experience and supported by Georgian National Tourism Administration. 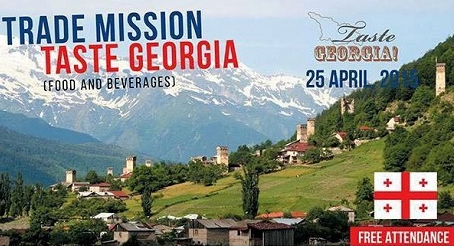 “The audience was very diverse and curious about new tastes from Georgia as well as wine history itself”, - Davit Jishkariani, the host of the event, noted. 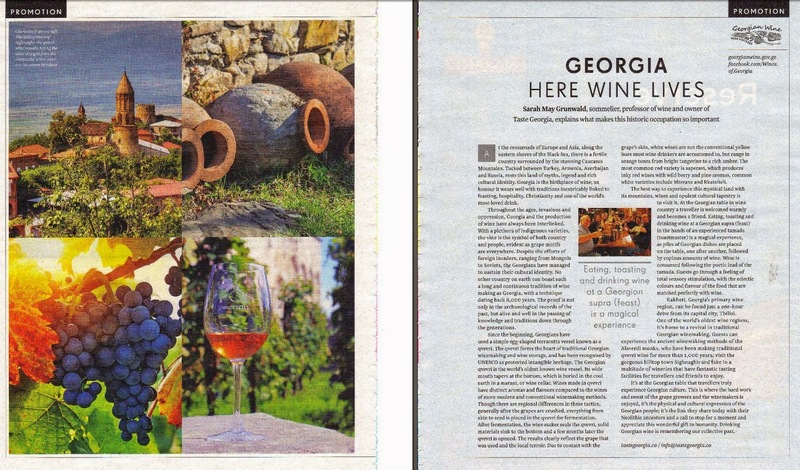 “We can say our word in wine tourism as here in Georgia wine, culture and history are intermixed, Uplitshikhe is a good example where you can stroll through the streets of 2nd millennium B.C. cave town and see the wines presses cut out in rocks as well as ancient Qvevri’s used for fermentation and this will be followed by tasting of wines made by the same traditional method by young and enthusiastic winemakers around. Uplisikhe is just one of quite a few prehistoric wine artifacts not to mention number of others connected with later Christianity all around Georgia.This is the experience hard to find in any other winemaking country." 24.04.2015. One of the biggest importers in China’s Xinjiang province is planning to import half a million bottles of Georgian wine – a threefold increase on its current quota, announced Georgia’s National Wine Agency. 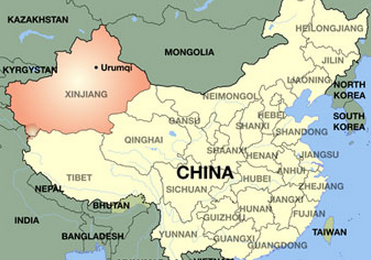 Agency representative Maia Tskitishvili held a business meeting with Xinjiang Beifangjianda Trade Co. Ltd leaders, where the sides agreed to deliver three-times the amount of wine to the Xinjiang province than current rates. 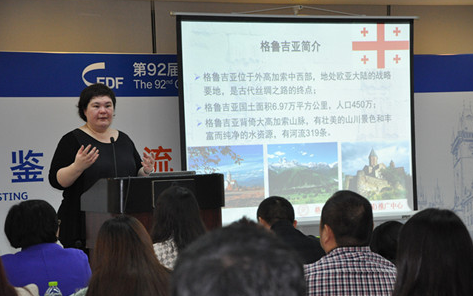 The host company organised for Tskitishvili to meet with local media in the Georgian Wine Club, located in the capital of the region Urumqi, where she spoke about the historic and cultural uniqueness of Georgian wine and the importance of the Chinese market in the expansion of Georgian wine abroad. She also outlined the contribution of the Xinjiang Beifangjianda Trade to the increasing awareness of Georgian wine and culture in China. 24.04.2015. The Czech Republic has hosted a Georgian wine tasting event. The Georgian wine tasting session was initiated by the Centre for the Promotion of Imports from developing countries (CBI), which is part of the Netherlands’ Enterprise Agency and commissioned by the Ministry of Foreign Affairs of the Netherlands. The Centre was established to support producers and exporters get a foothold in the market in the Netherlands, help business support organisations improve their capabilities and to act as a matchmaker between suppliers and buyers in the Netherlands and around the world. In 1991 its activities were expanded to the European Union. 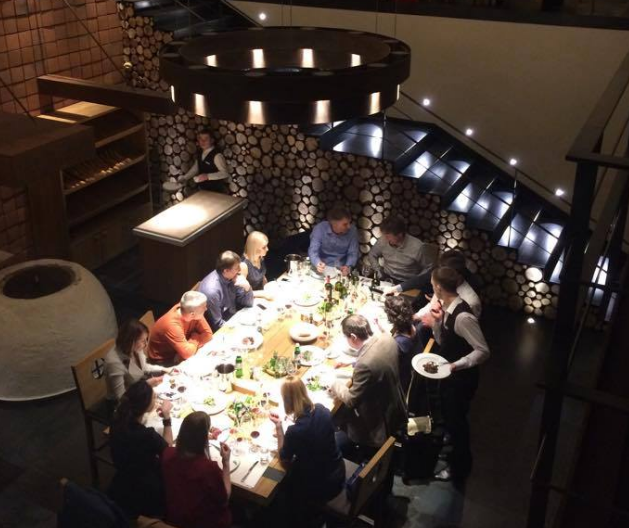 The event was also supported by Prague Wine Academy and Czech Republic’s Sommeliers Association. 22.04.2015. They may not be the bottles we reach for when looking for the perfect wine but vino made from Lebanese grapes, or cultivated in chalky English soil can more than stand up to their old world counterparts. 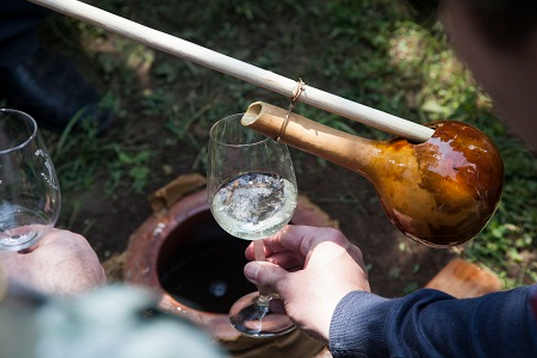 Some of these unusual wines are made using ancient methods – Georgian wine production started in 6,000BC, while there are others, like those produced in Romania, which are produced using more modern production methods. From Greece's retsina – which contains resin from the Aleppo pine - to a Georgian quince-flavoured wine made using ancient and traditional maturation methods unique to the region, we have spoken to five wine experts to discover the unique wines we should be drinking this summer. Anne Jones, wine expert at Waitrose told MailOnline: 'Georgia is renowned for its long history of winemaking - some of the earliest archaeological evidence of wine production, dating back to 6000BC, comes from the region. 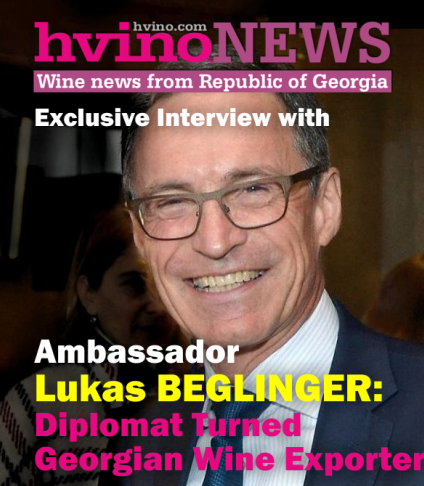 22.04.2015 (Hvino News) Georgian wine days titled "New Georgia" were held on April 17-18 in Ukraine, at Good Wine - one of Kiev's largest wine shops. Ukraine still is one of the main export markets for Georgian wine. Following wine producers participted: Lagvinari, Iago's wine, Gotsadze Family Cellar, Mukuzani, Petriaant Cellar, and Winiveria. 25 Georgian varieties, mainly qvevri wine, such as Chinuri, Tavkveri, Goruli Mtsvane, Tsitska were represented. Mikhail Ukleba, Georgia's ambassador to Ukraine, attended the events. 22.04.2015. For the first time in Georgia by the initiative of Georgian Sommelier Association about sixty famous artists have associated around one single subject – Georgian wine. 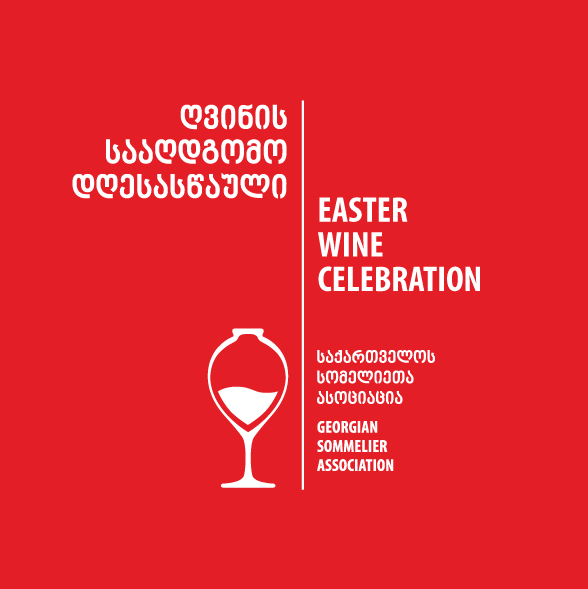 The works of different generations of artists, ceramists, sculptors and graphic artists on subject “Georgian Wine and Easter” will be exhibited. 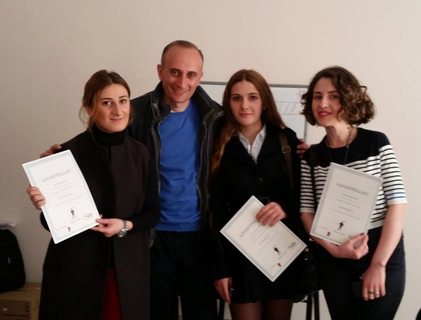 The exhibition of the artworks will be organized by Georgian Sommelier Association on April 22, 2015, at 6:00 pm, in the Tbilisi City Municipal Assembly Building. 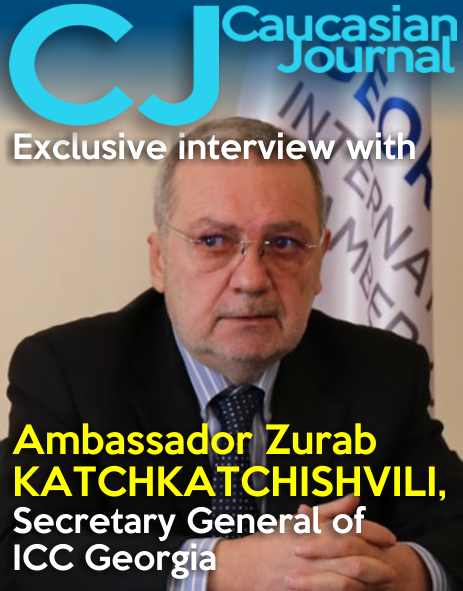 The authors of the works include: Zurab Nizharadze, Guram Kadjaia, Besik Arbolishvili, Gia Gugushvili, Ketevan Matabeli, Irakli Sutidze, Yuri Berishvili, Nodar Badurashvili, Koka Tskhvediani, Geno Zakaraia, Nugzar Mandjaparashvili, Ketevan Shalamberidze, Giorgi Iashvili, Leila Shelia, Zura Gomelauri, Guga Kotetishvili, Levan Margiani, Marika Izoria, Vano Abuladze, Ushangi Khumarashvili, Lulu Dadiani, Tato Akhalkatsishvili, Lia Bagrationi, Tutu Kiladze, Giorgi Areshidze, Ketevan Davlianidze, Ira Lavrinenko, Gigisha Pachkoria, Lali Lomtadze, Ketevan Iashvili, Tina Tskhadadze, Irakli Gabetsadze, Guga Kakabadze, Maia Kadjaia, Goga Tandashvili, Soso Nadiradze, Tamar Kuprashvili, Sandro Chkhaidze, Kakha Khinveli, Nutsa Mandjgaladze, Dea Soselia, Soso Chkhaidze, Maka Djebirashvili, Marina Mavrova, Tamar Vacheishvili, Khatuna Pipia, and others. 20.04.2015. The plot of classic fairy tale, epos or novel is composed of standard elements - stepping out of the hero from the starting point, adventure and getting back to the starting point again. Starting point could be anything, like a homeland, God, self or other changing idea, it depends whether from what angle we are reading the story. In my opinion, the story, with the hero in its center - Lado Uzunashvili, Georgian enologist and wine expert, counts its days from the late middle ages and up to now, continuously, in completely different time and environment, from knight clashes to Web 2.0. For this story, starting point is the village Mukuzani, Georgia, where two brothers, Shio and Makhare were born. Story brings us to the brothers heroic fall in struggle with Acharians, during the reign of the King Erekle II and to the sweetest melodies of Marita, their sister - „გაფრინდი, შაო მერცხალო, / გაჰყე ალაზნის პირსაო“, /Fly away, you black swallow, / trace the edges of Alazani/ (word by word translation), melody as a genetic code, rises up from the sunny soil of Kiziki and recalls in sad, precise and firm melismas of Hamlet Gonashvili and then as an underground flow, will shake the strings of Kizikian roots of our hero and such genetic memory will push him continuously to learn, comprehend the craft, to master and surrender many countries of the world, for returning to Kakheti at the end, village of Mukuzani, earth and sun power, vine, wine or to the starting point. So it is, Shio and Makhare return to their roots in this plot, i.e. to the material image (wine) in which the gene turned to be the most successful and capable. So it is in brief. 18.04.2015. 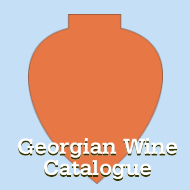 The number of people interested in viticulture in Georgia is increasing from year to year. Consequently, the demand for vine plants raised, and their production, especially rare plants breeding, has become a source of lucrative business. According to the report of the Ministry of Agriculture, nuts and wine have leadership positions in agricultural export, where nuts are only 2 millions ahead of the wine. Therefore, naturally, as in many other villages of Georgia, nuts remain the main source of income for local farmers in Ojaleshi micro zone of Targameuli village, Martvili Municipality. However, Ojaleshi grape and vine plan production has revived in recent years. It is a long time since the Salkhino monastery monks of Chkondidi eparchy produce wine from Ojaleshi grape grown in specific micro zone near the river Tekhura. However, the development of sales in recent years is connected to the small enterprise Vino Martville who purchased ½ tons of Ojaleshi grapes from the local farmers and produced wine in the village Targameuli in 2012. Their production paved the way in a short period and in two years time their wine established itself in a high-price segment, both in local and foreign markets such as London, in some high-class restaurants. 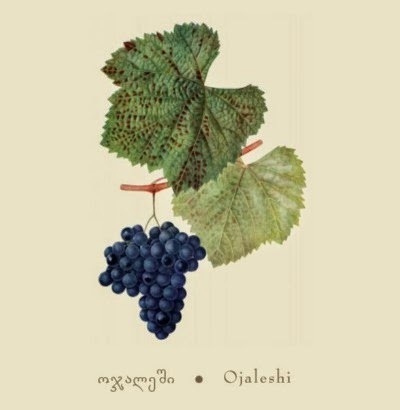 The example of Vino Martville showed that the demand on Ojaleshi grapes is high at home and abroad. 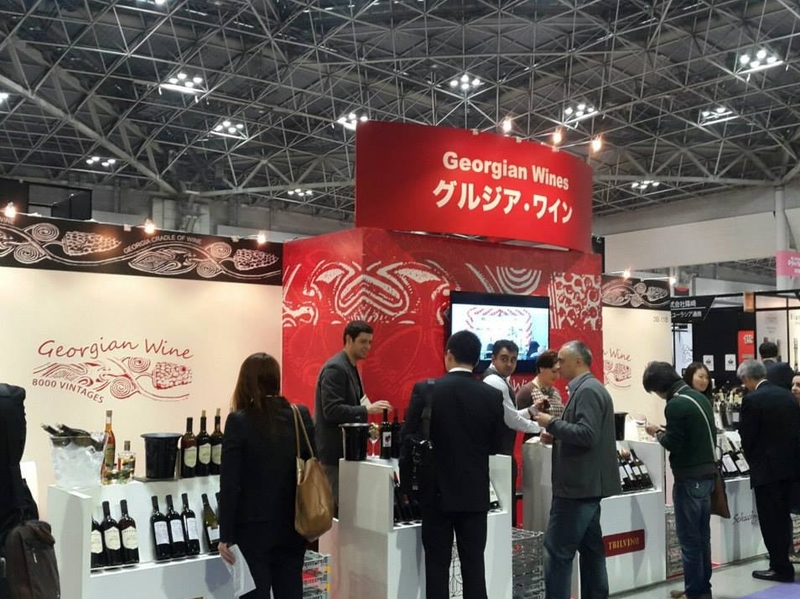 17.04.2015.The sixth edition of Wine and Gourmet Japan is here, where exhibitors from 20 countries, including newcomer Georgia, are presenting their products at the large-scale wine and gourmet food trade fair. More than 75,000 visitors have visited Tokyo this week, where the Wine and Gourmet Japan exhibition is taking place from April 15-17, 2015. The three-day expo has become Japan’s hub for national and international wine, beer, spirits and the gourmet food industry. Georgia, which is participating in Wine and Gourmet Japan for the fist time, has presented products from six local wine producing companies: Besini, Kakhetian Wine Cellar, Schuchmann Wines Georgia, Tbilvino, KTW and Kindzmarauli Marani. Exhibitors from 20 countries, including France, Germany, Italy, Japan, Spain, South Africa, presented their products in this year’s festival. As well as receiving the returning participants, Wine and Gourmet Japan welcomed new participants from Georgia, Sicily and Thailand. 16.04.2015. 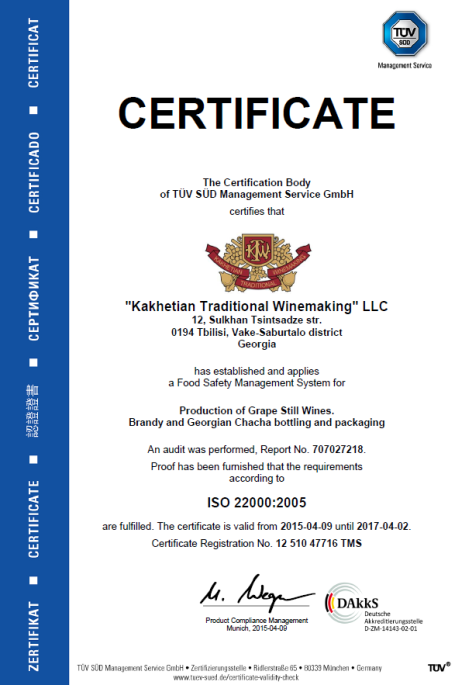 Kakhetian Traditional Winemaking company informs that, as a result of certification audit on 9 April 2014 by the German expert company TÜV SÜD Management Service GmbH, the company’s wine producing plant in Velistsikhe (Kakheti), opened in September 2014, has been certified according to International Organization for Standardization ISO 22000:2005, which is a proof of the food safety and quality management. By introducing this food safety system, KTW ensures the consumers’ belief that the company’s products are of high quality, safe for human health and protected from physical, microbiological and chemical hazards at all stages of raw materials’ procurement, production, transportation and storage. 16.04.2015. People have been making and drinking wine around Tbilisi, the capital of Georgia, for 7,000 years. Bounded by the Black Sea to the west and the Caucasus to the north, Georgia is perhaps the most exciting newcomer on the international wine scene, with offerings as diverse (500 indigenous grape varieties) as they are distinct (fermentation underground in clay vats called qvevri). Only in Tbilisi, though, can you sample the full breadth of Georgian wine, from the nutty, mineral-driven amber wines of the East to the plummy, semi-sweet reds from the West. The United States imports just 1 percent of Georgia’s yearly production, which means that the best and often most interesting bottles—those made by small-production wineries—don’t make it across the Atlantic. If you want to taste the best that Georgia has to offer, you'll have to make the trip. 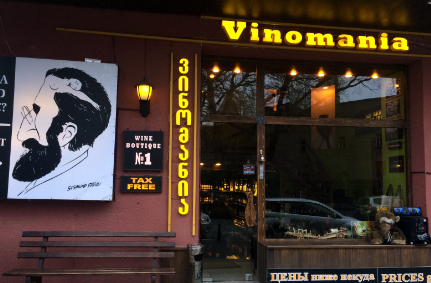 The good news for travelers is that Tbilisi, a budget-friendly city with dozens of new wine bars and tasting rooms, has grown into a veritable and largely undiscovered wine destination. It exhibits the self-assured excellence of the world’s most historic wine regions without the accompanying price tag or the snootiness. Its cuisine is an East-meets-West fusion of freshness and spice, with walnut-thickened sauces, cilantro, and dried marigold petals among the culinary staples. And as for hospitality, it’s the sort of place where strangers insist on walking you to where you need to go when you ask for simple directions. 15.04.2015. Meet Maka Kozhara: a wine expert. Young, intelligent, friendly. Kozhara sits in an immense cellar in a muddy green valley in the Republic of Georgia. The cellar lies beneath an imitation French chateau. The vineyards outside, planted in gnarled rows, stretch away for miles. Once, in the late 19th century, the chateau’s owner, a Francophile, a vintner and eccentric Georgian aristocrat, pumped barrels of home-brewed champagne through a large outdoor fountain: a golden spray of drinkable bubbles shot into the air. Kozhara twirls a glass of wine in her hand. She holds the glass up to the ceiling light. She is interrogating a local red—observing what physicists call the Gibbs-Maranoni Effect: How the surface tension of a liquid varies depending on its chemical make-up. It is a diagnostic tool. If small droplets of wine cling to the inside of a glass: the wine is dry, a high-alcohol vintage. If the wine drips sluggishly down the glass surface: a sweeter, less alcoholic nectar. Such faint dribbles are described, among connoisseurs, as the “legs” of a wine. But here in Georgia wines also possess legs of a different kind. Legs that travel. That conquer. That walk out of the Caucasus in the Bronze Age. 10.04.2015. At a wine-tasting event organized by the British-Georgian Chamber of Commerce (BGCC) in the newly opened, intimately sophisticated Vinotel, a select (and very honoured!) group of mixed nationalities and professions was invited to taste a selection of four different English wines (English, not British, as I was quick to discover). Chris Foss was our host- a man of British-French origin, a microbiologist who fell in love with the wine-making process at a young age and spent many years in France (particularly Bordeaux, the home of his mother) training, before moving to England some 25 years ago to work at the Plumpton College in East Sussex in the south-east of England and to take on the role Chairman of the South East Vineyards Association (the largest group of vine growers in the south-east). Aside from two Brits (myself included) who had never before tasted the wine of their native England, Mr Foss’ guests included Chris Schlueter, the Head of BP in Georgia and his wife; Giorgi Tevzadze, Adviser to the Chairman of the National Wine Agency and an active participant in the wine sector since 1986; Meko Kipiani of the family producing Kvanchara; a representative of Deloitte who, with funding from USAID, has recently been arranging wine tasting courses for certification; a local winemaker; a lecturing sommelier; and other wine experts and wine lovers. 09.04.2015. Ènek poured a rosy colored splash of wine into our glasses, avidly explaining how this particular Aladasturi grape vine was meticulously cultivated in its native west Georgia. In a tasting ritual uncommon in Georgia, we swirled it, sniffed it and savored the flavor as it caressed our tongues. Here in the “cradle of wine,” the land where viticulture is believed to have originated 8,000 years ago, wine is customarily poured into a water glass and “tasted” in one long drag, until drained. 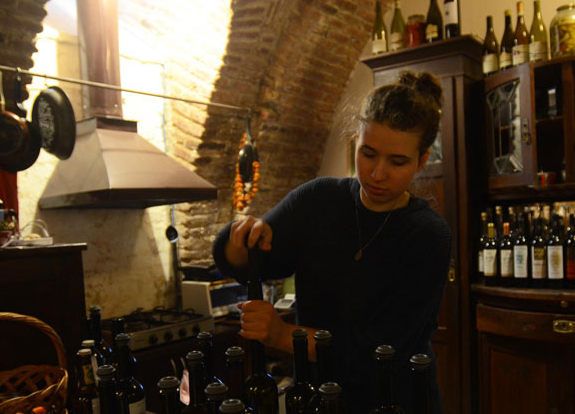 But in this cozy cellar in the heart of Tbilisi’s historic Sololaki neighborhood, seven winemakers have come together to offer an alternative convention to winemaking and consumption. They call it Vino Underground, but we call it wine heaven. 08.04.2015. The British Georgian Chamber of Commerce has good news for representatives of marketing and branding departments of wine producing companies and all interested people. 07.04.2015. Women are majority among the certified participants of viticulture study course organized by the School of Wine Club. The winegrower and winemaker, Mr. Iago Bitarishvili, led the trainings in viticulture held on April 4-5 at the National Wine Agency. The following topics were discussed during the study course: the essence of organic farming, its basic principles, vine pruning-formation, ways of soil fertility maintenance in ecological viticulture, mulching the soil surface, the use of plant protection in viticulture and so forth. Training program included voluntary certification and participants took a test at the end of two-day training. There is a growing interest of women in such topics as wine tasting, wine and food pairing. 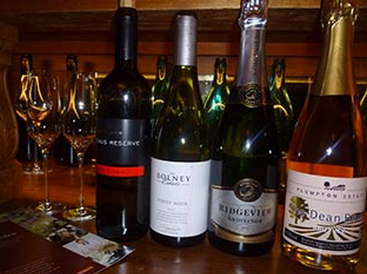 School of Wine Club is operating since 2012 and about 400 people have been trained. 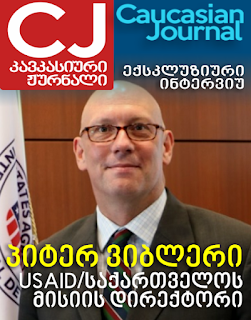 Initially, the program operated within USAid's EPI Program, and this year the National Wine Agency supports it. The number of registered applicants was unprecedented, that is why the demand of all people who wished to attend to the courses could not be satisfied. Trainings will continue during 2015 in different directions such as how to taste wine, wine offer and service, winemaking, viticulture, wine defects and diseases, wine and food pairing. 07.04.2015. Terjola Wine Cooperative is expanding its business. Instead of 700 bottles, this year up to 3 000 bottles of wine produced by the cooperative will be exported to Japan. The Japanese will be able to purchase a bottle of Terjola wine for $ 10. 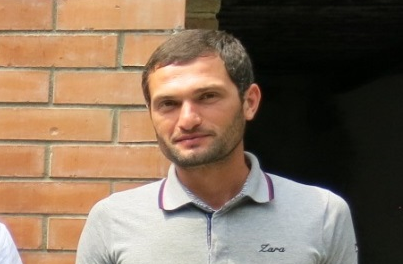 According to Gogita Makaridze, one of the founders of the cooperative, production has increased after the cooperative was established and the costs and working in the vineyard reduced at the expense of distributed liabilities among the members of the cooperative. Gogita Makaridze first succeeded in the Wine Fair, where Japanese investors were interested in his family wine. According to him, due to the scarcity of land, he produced small quantity of wine, afterwards along with the rest 6 members of the cooperative, took part in the European Union's ENPARD Programme (European Neighbourhood Programme for Agriculture and Rural Development). Terjola Wine won in the competition and was given the necessary equipment to boost productivity. In the future, the cooperative Terjola Wine plans to expand vineyards, to increase the number of cooperative members and to turn Terjola Wine into a brand. As they say in the cooperative, they produce a bio-product which does not have any chemical additive and is completely natural. 05.04.2015. 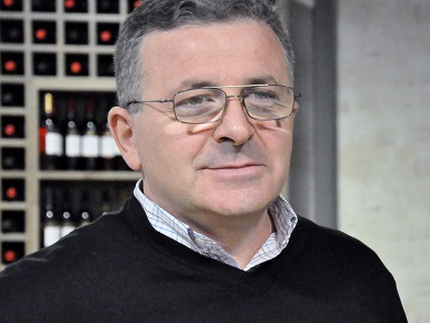 George (Gogi) Dakishvili has been working in the field of viticulture and winemaking for about twenty years. Today he is a chief winemaker at Schuchmann Wines Georgia. 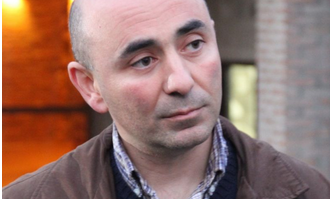 However, it seems that, Gogi’s personal example and liberal attitude worked well as his elder son, Temur Dakishvili connected his life - education and work - to the wine. He created an interesting brand "Vita Vinea". 04.04.2015 (Hvino News). 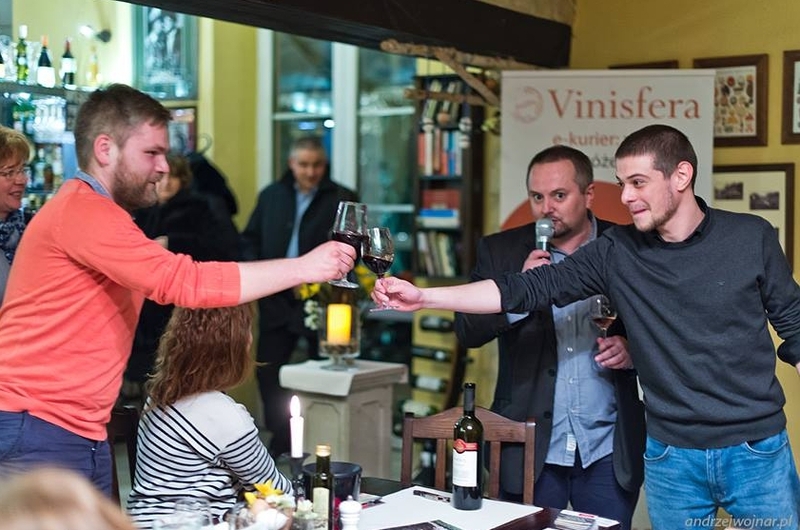 In Poland, a major export market for Georgian wine, National Wine Agency organized a series of wine promotion events in Warsaw and Krakow, to raise competitiveness of Georgian wine and chacha in the international market. Om March 26th in Warsaw a seminar and tasting of Georgian wine was held. Presentation of chacha and innovative cocktails based on chacha took place next day. On March 30-31 seminars and presentation of wine and chacha were held in Krakow. 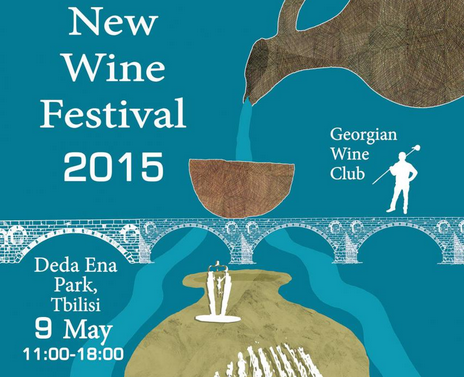 It is the first time when Georgian chacha was represented together with wine. 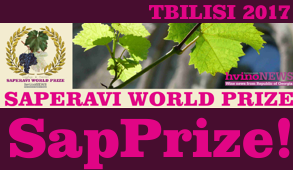 The following wine producers were represented: Vaziani, Chelti, Kindzmarauli Marani, WineMan, Schuchmann Wines, KTW, Teliani Valley, Armazi, Besini, Chateau Mukhrani, Tbilvino, Dugladze Wine Cellar, Telavi Wine Cellar, Corporation Kindzmarauli, Tiflis Wine Cellar. 02.04.2015. According to National Statistics Office of Georgia’s preliminary data, export of Georgian wine has fallen to constitute 3,1% of the country’s total GDP in January-February period. In comparison, the figure was 7,3% in the same period of last year. In monetary equivalent the fall is USD 22 million, with this year’s wine exports having brought the country USD 10 million, compared to the 32 million in the corresponding period of 2014. Tbilvino told Caucasian Business Week that the Russian market represented 25% of the company’s total export last year. Whereas, the company’ objective this year is to complete half of that amount. Most of the wine companies in Georgia are experiencing this two-fold fall in exports to Russia and Ukraine. 02.04.2015. 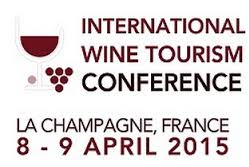 The 7th International Annual Wine Tourism Conference (IWINETC) will be held in La Champagne region, France, on April 8-9. It will be followed by the workshop with the participation of professionals on April 10. The main direction of IWINETC this year will be professional development, research, branding and marketing, network communication. The International Annual Wine Tourism Conference, Exhibition & Workshop each spring is the main event in the Wine and Culinary Tourism industry calendar of the world. 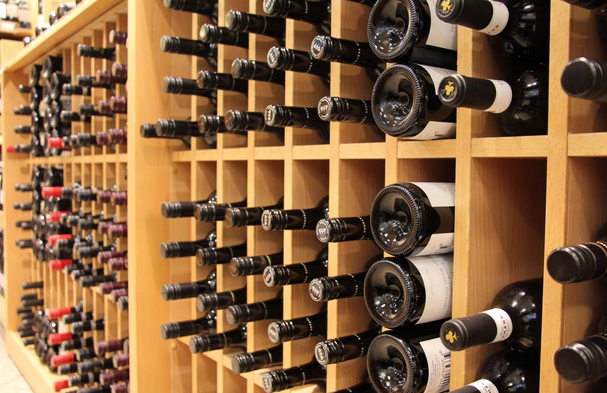 More than 300 varieties of wine from 45 countries will be presented at a 2-day program that will include around 30 talks, workshops and symposiums. 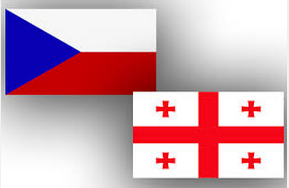 Georgia had the honor to host the conference in Tbilisi in 2014. The National Wine Agency will be one of the main characters this year at IWINETC La Champagne, as it is the gold sponsor of the event. 27.03.2015 (Hvino News). In the course China Food & Drink Fair in Chengdu, China (March 26-28) several Georgian wine master classes were conducted by Chinese wine experts. One of the master classes was given by Fongyee Walker, managing director of Dragon Phoenix Wine Consulting. About 50 attendees gathered at the Georgian wine master class by Fongyee Walker, who were representatives from trade and media, as well as consumers. It was the first time for most of them to taste Georgian wine and they appreciated the opportunity to learn about this "old but new" wine region. Fongyee Walker is associate of the Institute of Wines & Spirits (AIWS), and mainland China’s most qualified wine educator. A popular wine presenter, she judges for leading Chinese magazines, Chinese wine challenges and serves as an international judge. Fongyee writes for several Chinese and international wine publications and is co-author of The Cambridge University Guide to Blind Wine Tasting. Demand of Georgian wine is on the rise in China, which is the fourth largest importer of Georgian wine in February 2015. A total of 217,000 bottles of Georgian wine was exported to China in the first two months of the year, which was 64 percent more compared to the same period of 2014. 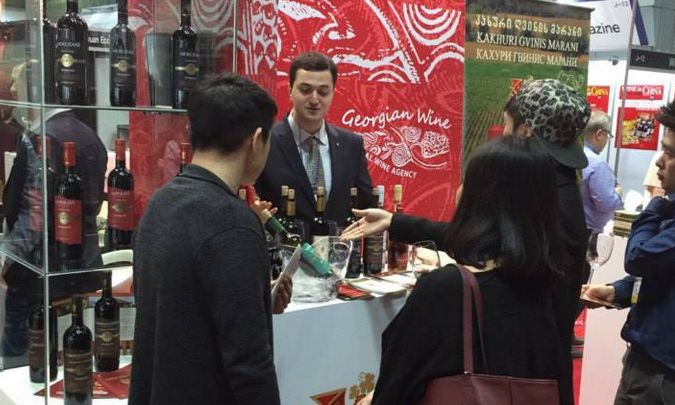 A total of 10 Georgian companies have participated in the China Food & Drink Fair in Chengdu. 01.04.2015 (Hvino News). It is well-known from several medical research reports that moderate wine consumption has many positive health effects. National Institute on Alcohol Abuse and Alcoholism (NIAAA) reported, that in addition to having fewer heart attacks and strokes, moderate consumers of alcoholic beverages (especially wine) are less likely to suffer strokes, diabetes, arthritis, enlarged prostate, several types of cancers, and even Alzheimer's disease. Now, the new data gathered by Georgian scientists reveals that wine consumers have one more scientifically proved evidence in favour of their drinking habit. According to the researchers from Georgia's National Public Health Research Institute (NPHRI), the children are more musically-gifted if they are born to families where both parents are regular wine consumers. The team of scientists, consisting of various specialists including children psychologists and nutrition doctors, have conducted multiple testing as well as polls, which have revealed strong relationship between the number of children with artistic talents - especially musical - and the level of wine consumption by both parents. "We must, however, take this result with caution", - said Dr. Ashram Singh MD in his comment to the Georgia's NPHRI research report published in Britain's oldest medical journal The Lancet Annals. "The higher rate of musically-gifted children appears only in families with moderate level of consumption. At levels higher than 1 bottle per day this tendency disappears. 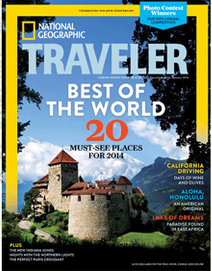 We do not advocate wine drinking, and hope that readers will not start believing that tipsy parents are a good thing".